We can't think of any!! 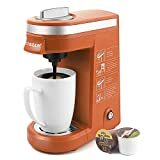 This is a great little Coffee Maker. 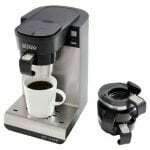 We highly recommend this easy to use coffee maker. 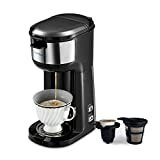 This Hamilton Beach Single Serve Scoop Coffee maker goes where no coffee maker has gone before, brewing hotter, faster and better-tasting coffee than most gourmet coffee machines out there. And, its benefits don’t stop there. 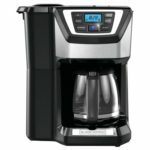 The Hamilton Beach Single Serve Scoop Coffee maker utilizes the simplicity of ground coffee and brews a customizable cup quickly: an 8 oz. cup in less than 90 seconds or a 14 oz. travel mug in under two-and-a-half minutes. 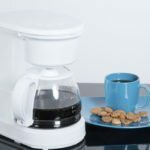 Aside from its versatility in using inexpensive coffee grounds, The Scoop Coffee maker is designed for ultra-simple preparation in three straightforward steps: 1) Scoop 2) Place 3) Brew. It features a steel mesh scoop for filtering freshly ground coffee. 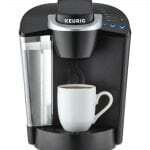 It also comes with a built-in, adjustable stand that flips to accommodate a standard-size cup or a taller travel mug. 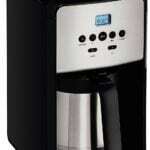 All in all, this Hamilton Beach Single Serve Scoop coffee maker offers affordability and no fuss with lots of options. There’s no need for extra equipment or high-tech buttons either. 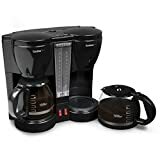 The Hamilton Beach Scoop Coffee maker doesn’t need pre-packaged K-Cup packs or coffee pods. These tend to get expensive, and not to mention stale, over time. Instead, it comes with a mesh scoop filter that gives users the choice of any flavor (caramel, hazelnut, vanilla, etc), any brand (Starbucks, Dunkin Donuts, etc.) and any strength (Regular or Bold) pleasing to their taste. The other great thing about a mesh filter is that you won’t have to buy replacement filters. 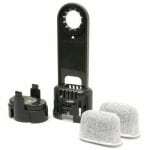 Simply wash it thoroughly after use, allow to dry and then pop it back into the coffee maker. 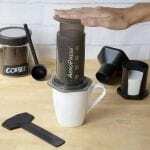 With The Scoop Coffee maker, versatility is key. Whether you decide to go with a mainstream brand coffee or stronger premium brand coffee, you need a machine that understands and quickly adapts. 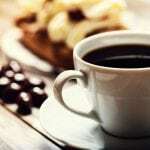 Use the REGULAR setting for a quick basic, automatic drip coffee. Or get an upgrade and choose BOLD for more fine grinds, decaf or stronger flavors premium brand coffee like Starbucks or Melitta. Just remember that the finer the grind, the longer it takes to brew. For bolder coffee, the water passes through at a slower rate. However, it allows more contact time and better flavor extraction for a better-tasting cup when done brewing. Not sure how much coffee to add when brewing? No worries — each scoop filter is labeled with two measuring lines for exact serving amounts. And more isn’t necessarily better, in this case. Overfilling the scoop doesn’t allow room for brewing and water can overflow and spill over, ultimately meaning weaker coffee. So be sure not to fill above that second measuring line. It may take some trial and error before you find the perfect measurement for your taste buds. However, don’t be discouraged – your patience will be rewarded with a brew that is exactly the way you love it. Before brewing, adjust the L-shaped cup rest to make sure your cup is as close to the dispensing nozzle as possible. For travel mugs, fit the cup rest against the coffee maker and place your mug on top of the drip tray. Now you can simply have the brewer fill your travel mug and you’ll a lovely brew to sip on your way to work. 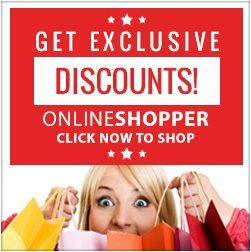 The Hamilton Beach Single Serve Scoop Coffeemaker was awarded the “2012 Good Housekeeping Very Innovative Products (VIP) Award” by Good Housekeeping Research Institute. 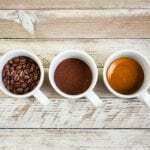 In addition, the Industrial Designers Society of America (IDSA) gave it high rankings for its ability to use coffee grinds, instead of packs or pods, and simultaneously give users the freedom to choose their own flavor, strength and cup size for their coffee. 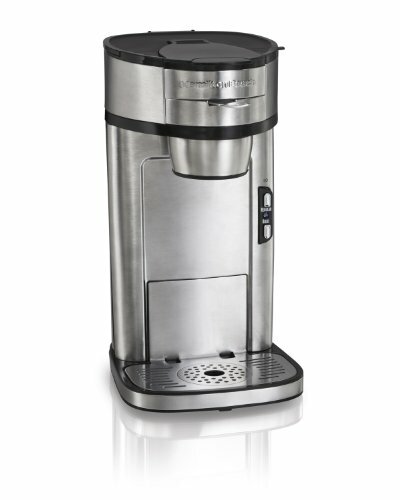 In conclusion, The Hamilton Beach Single Serve offers a host of wonderful features with an award-wining design. 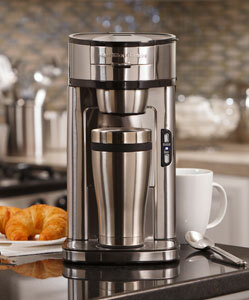 All coffee lovers would agree that this brewer offers a great coffee-making experience. Remember to carefully note how this coffee maker will need to be cleaned. You will need to pay special attention to the scoop filter as left over ground coffee will affect the new batch the you brew. It’s best to clean the filter after each use to avoid impurities in future brews. 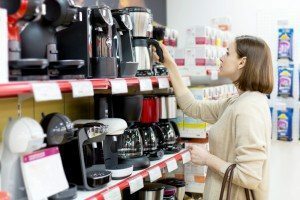 When searching for a new coffee maker to purchase, ensure that you look over the features carefully. Comparison shopping is also good way to ensure you’re choosing the right brewer for your needs. 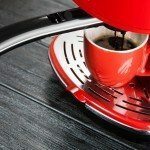 No matter your choice, you’re sure to find that a coffee brewer is an excellent asset to your kitchen. And it’ll likely make your kitchen counter look classier too! So stop hesitating and go buy that coffee maker you’ve been dreaming about. You won’t regret it and the rest of your household will be pleased as well.